Aside from working on a series of feminine paintings (that's more than I was planning on saying, but I'm warming up to the idea of sharing them with y'all) parenting is 100% where I'm at right now. And looking at both of these efforts, I see that I'm shaping women on the canvas while doing some deep shaping of these two precious little women who call me Mommy. My life and art layered over one another with real similarities—but it gets clouded by the feeling that while I can see the potential in all of these women I'm just not sure if I have what it takes to help any of them fully achieve theirs. So I edit, erase, study, learn, and try again. It's slow work right now, y'a'll, both in the studio and at home. But this is art at the life-level...no, at the soul-level. There's something beautiful about living these layers. Something honest and real and raw. When we stop and actually look at it, life is not as disjointed as it seems. Ask for integration and watch how life pulls the layers together, sliding one on top of the other until you see it all as one beautiful picture—all the questions you carry, all the random tasks and conversations, all the hopes and dreams. It all fits. Hold it up to the light to let the layers show through. There's a synchronicity there waiting to reveal what your current days are all about. I'm a die-hard believer that inspiration isn't something we must wait for while sitting on our hands until it comes. We can go out and get it. Take note of those things that spark inspiration and ideas. And return to them faithfully. This is the magic of Cameron's "artist dates" and the magic of the creative process in general. Shots from a recent trip to gather inspiration. Oh how my mind danced! You have been an important part of my journey as an artist, and I’m excited to share more growth developments with you! 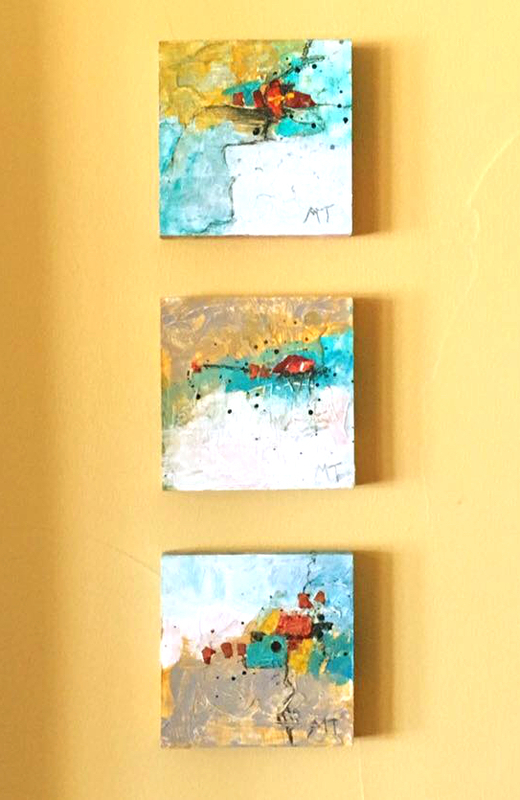 As you’ve seen in the past year, MT Art has not only grown into a downtown presence at the Brunswick Stewdio, but my art is being displayed in many venues in our area. And with continued attention comes a greater community of patrons and supporters. We are also setting exciting precedents in how we use proceeds to invest in charities that change the future for women and children who are oppressed by human trafficking and/or abandoned by their families, as we donated all of December’s proceeds to the International Justice Mission. We want to continue to make significant donations to this cause and others. To reflect all of these changes, as well as my continued growth and establishment as a local artist, we will be raising prices in March. This is an exciting development as it means that the work you’ve collected from me will be considered more valuable. 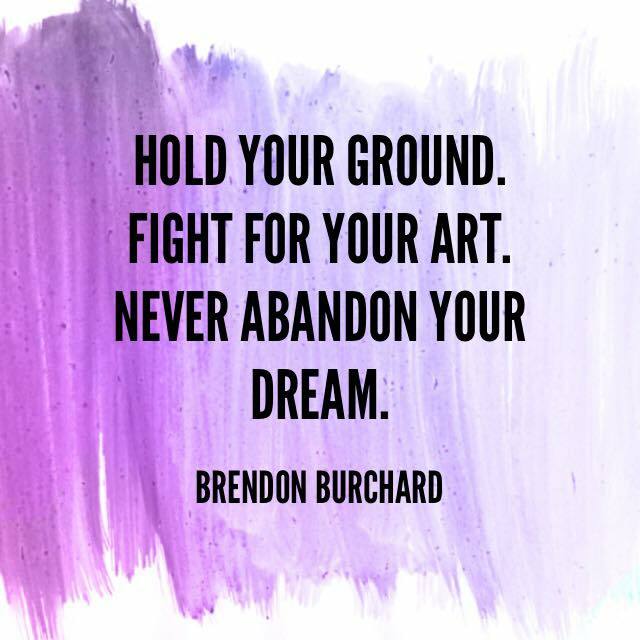 Not only that, but your future investments in my art will fold into the charitable donations that MT Art will continue to make. As an artist, my deepest desire is to create art that speaks to the soul and inspires change. I am seeing dreams come true more quickly than I can absorb, and the dream of being an artist has blossomed into something that is extending not only to your life but to the lives of others who’s names and faces we may never know. Thank you for partnering with me and being a part of the art. You mean more to me than you know. When I was in the music, the visual was my play. Now I'm in the visual, and the music has become my play. Mostly, drums. But it's time to pull the guitar back out, dust off the fretboard, and rebuild those callouses. 2016 Is about balance. About the toggle between work and play. Rest and energy. Creating and discovering. Returning to the guitar is a return to who I was, and who I still am. It's a return to an expression that has always held a sense of wonder and play. "As the saying goes, 'Argue for your limitations and you get to keep them.' Why would I want to keep my limitations?" As quoted from Brene Brown's Rising Strong. I'm slowly working my way through this book, digesting her words about our falling and rising, about integrating all aspects of ourselves from the good to the bad, owning our stories in ways that make us strong, whole, and wholehearted. All of this comes at a time where I am working hard to embrace my adventure: to integrate aspects of myself that are not easy to own: my High Sensitivity and consequent social anxiety. Working within one, working my way out of another. "What if I make it big?" One of them said she was worried: What was I going to do if I made it "big" with a lot of attention and couldn't keep up with everything and everyone? Who doesn't dream about failing math? I've heard from so many who have that recurring dream where you are failing out of math class. For years, the dream brought the feeling of panic, maybe even shame or failure. The constant theme is that I'm not good enough and I need to double up in order to make up for that academic deficiency. But something has changed for me recently. I'm looking deeply at some of my own real-life deficiencies in an effort to accept them, accept me. I'm learning about the "limitations" ingrained in my life as an artist, that are the flip-side of the coin of being highly creative. I'm learning that I can't erase certain "failings," if that's even what they are. We think it's all about being a hippie-free creative. Life-liberated in pursuit of art and self-expression. But there is a dark side. The side where I'm also a Highly Sensitive Person. What is "exciting" to you is terrifying and overwhelming for me. I have great difficulty being in crowds, new situations unnerve me, if I don't have an "exit" plan I will go into sheer panic. I see, hear, and feel everything. I don't accept many of the invitations to social engagements, even though I deeply love those who invite me but I just can't love all of them in a tiny space at one loud noisy bustling overwhelming time. People assume that I am friendly and outgoing, but this is simply because I've learned to wear the persona of the rest of the world and no-really-I-just-want-to-go-home. What sounds like a great Friday night for you would keep me up for hours after I come home. Oh and I would've been dreading it for at least a good 24 hours beforehand, so I'm exhausted by the time I get there. Traffic jams, strangers, unfamiliar cities, family reunions, ceremonious occasions, eating out—and sometimes, if I've been home for days, going to the grocery store—will bring on panic. Yes, there's a beauty to this: I prefer the kind of quiet that allows me to hear the soul-stirrings in my own head so I can turn them into paintings. I have an intuition that helps me see things that a lot of others can't. I am all in for one-on-one conversations. I do deeply love my friends. I use the word brave a lot because SO MUCH scares the ____ out of me. Despite the beauty, I've only focused on the failings. And when it piles up, it comes out in my dream of failing math. I was still failing math. But here's the change: my reaction was beautifully different. My reaction was that I could still be a good college student and graduate, even while failing miserably at math. No panic. No rush to erase the mess and try to bargain my way into getting a better grade. No trying to "fix" it. Can I really apply this to my daily? Can this become my new reality? That I can still be a good artist even while I'm terrified and overwhelmed in normal life circumstances? You can still be a good parent, even while _____________. You can still be a good employee, even while ___________. You can still be a good spouse, even while _____________. You can still be a good friend, even while _____________. You can still be a good YOU, even while ______________. This whole creativity thing works like the Fight Club. There's a battle our own self-rejection and creative acrobatics. We have extensive inner dialogs, working out the intricacies of a good/bad idea. It's all mush. It can get ugly. But OH the glory that comes when something comes to life. OH the glory. This is why we are in the fight. Brene, the one who is changing our culture, has much to say about creatives and the arena. If you love Brene Brown, creativity, or self-understanding, this is for you. Let somebody else be better? "Let's just anticipate that we (all of us) will disappoint ourselves somehow. Go ahead and let it happen. Let somebody else be a better mother than you for one afternoon. Let somebody else go to art school." Elizabeth Gilbert, a brilliant author and speaker, has the ability to call things out of me that I didn't know were there. And did you see where she said I should let somebody else go to art school? Let somebody else be better? The comparison has gotta stop. The what-ifs and why-nots. The demands to be better have got to go. Because I am only able to be my best self when I embrace who I truly am and what I have and haven't done. I can't afford to give up on my dreams because I may (or may not) be late to the artistic party. I can't just stop what I'm doing as an artist because somebody else's degree is more official than mine. At least that's sort of what Elizabeth Gilbert said to me. In this recent article Gilbert is adamant that women are doing enough, that we ARE enough, and yet we scold and punish ourselves for all that we think we aren't. I want to invite you to read her words. For the sake of who you once were. For the sake of who you are now. And for the sake of who you are becoming. You can read the article in full HERE. It's the voices in our heads that cause more problems than any external sources of negativity. Twyla Tharp's "inner critics." Melissa Dinwiddie's gremlins. Can you hear them? They are the echoes of old teachers, our parents, a harsh classmate, a coach, an insensitive professor, the boss that never understood you. These voices swirl around with your own sense of perfectionism or pride or fear and suddenly you're caught in an inner maelstrom of negativity and you have no idea how to proceed. This inner maelstrom can stop me in my creative tracks. And because I'm so quick to agree, to add my own fear-based perfectionism to their ongoing ticker-tape of negativity, I'm slowly and patiently working to be more kind and patient to myself. It's hard, this self-compassion thing. I feel like I'm rushing to play catch up as an artist -- having given up on being an artist when I headed into college, and then falling back into it a few years ago. I feel so very behind, like I'm making up for lost time. But instead of being patient and understanding with myself, I push myself to work harder faster and more efficiently in order to catch up with this standard. I'm going through a class with Melissa Dinwiddie right now and it is changing the way I nurture my own inner artist. It's SO hard, but I'm being challenged to slow down a bit and be more kind/understanding with myself. So here I am wondering if the old adage still applies: "Kill them with kindness." Can we silence our inner-critics in such a fashion? Will this degree of inner-compassion actually soothe the fears that bring us to a place of self-beratement and impossible standards? Aren't we just wrestling with the scared insecure parts of us that are self-protective and perfectionistic anyway? I wonder what would happen if I stopped expecting and started accepting... If I kindly joined myself where I am: Just a few years into life as an artist and mommy. Just a few years into this sort of rebirthing. I'm still toddling. Can I give myself permission to toddle? Can I give myself permission to not-yet-know? Can I be kind and compassionate? I shake my head as I type out these questions. I don't know if it's possible to be this cooperative with myself, but I deeply desire it. I need to change the way I talk to myself, rewrite some inner dialogs, and work to be more of a fan than a manager. Do you talk to yourself? Are you able to silence or soothe the inner critics, quiet your gremlins, and get to work cooperating with your own soul? How do you foster inner peace against perfectionism and impatience? Want more? Sign up for Greetings from Mandyland And get free copy of The Pace Book: Finding and Setting Your Creative Pace, as well as other adventures in creative play and inspiration!